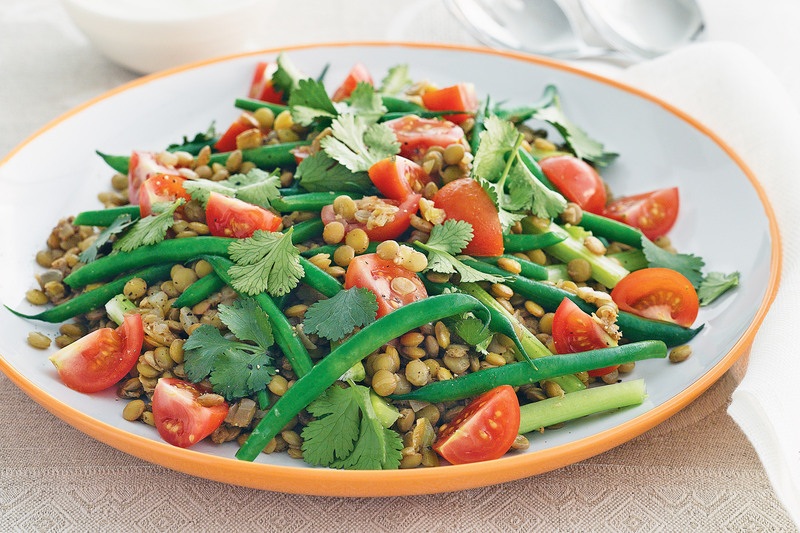 Delicate lime-infused lentils complement the bold juiciness of the celery and beans. This colourful dish is a meal in itself, but also makes a high-fibre side salad for a summer barbecue. Place the lentils and 1.5L (6 cups) cold water in a large saucepan and bring to the boil. Reduce heat to low. Simmer for 25 minutes or until the lentils are just tender. Drain. Meanwhile, heat the oil in a non-stick frying pan over medium heat. Add the onion and cook, stirring, for 5 minutes or until soft. Add the garlic, ginger and garam masala, and cook, stirring, for 1-2 minutes or until aromatic. Transfer the onion mixture to a large heatproof bowl. Add the lentils and lime juice, and stir until well combined. Season with pepper. Set aside to cool completely. Cook the beans in a saucepan of boiling water for 3-4 minutes or until bright green and tender crisp. Refresh under cold running water. Drain. Add the beans, tomato, celery and coriander to the lentil mixture, and stir until just combined. Divide the salad among serving plates. Serve with the yoghurt. Tip: If you’re short on time, use 2 x 400g cans brown lentils, rinsed, drained, instead of the dried brown lentils.